The following guest post is an interview with Colleen Rochette, orchid care expert and orchid enthusiast. She writes a great blog, Lady Orchid, which I recommend you check out for some very interesting and entertaining posts! 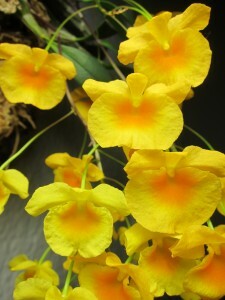 Colleen: Admittedly, my early interest in orchids has blossomed into a glowing, fiery crush. In January of 2013, Lady Orchid was kindled with these sparks. Giving nod to the desire to chronicle my orchid observations, pages of notes were penned and photographs were neatly tucked away on my computer. As my menagerie multiplied, this pen-to-paper routine became monotonous. I was in need of a more comprehensive outlet for these flowery feelings. I felt as if my musings and snapshots ought to exist collectively; I wanted to easily reference this information as my posse matured. In turn, my sun-filled weekdays are lovingly spent in a colorful corporate office. In an effort to revive my subdued inner intimacy at the end of the day, I wax-poetic via my blog. Colleen: I think that it would be safe to say that almost every orchid enthusiast has a classic Phalaenopsis story, so I will willingly omit this. But as I reminiscence, my Mum had always provided me with that special intrigue and guidance as I started to amass my own orchid collection. To this day, we continue to inspire and challenge one another with our personal orchid preferences and growing techniques. Having a partner in crime is so lovely! Coincidentally, our collections are of a similar size, but we only have two or three of the same orchids. It has been a real treat to become closely acquainted with her beloved caboodle. Secretly, I am also a little jealous that she is able to summer her orchids outdoors! Colleen: Currently, I have about 65 orchids growing in our apartment. In the corner of the living room, we have a southern window which is adjacent to a west facing window. Most of my orchids live here, basking in the rays from the double exposure. My growing set-up consists of an elongated, hardwood table placed beneath the southern window. This is topped with two 20″ x 26″ quad-grate humidity trays. A chrome “D” shaped shower curtain rod hangs from the ceiling above the table and is suspended by three ceiling supports. Sailcloth curtain panels hang along the curvature of the shower bar. The curtains can be drawn to help contain the humidity in dryer months, but they usually remain draped over the top of the bar to allow sunlight into the room. I also have a 6″ clip-on fan running at all times and throughout the spring, summer and fall, the top and the bottom of both windows are left open to welcome the breeze. When needed, I use a Wonderlite as a supplementary light source and I keep a small, ultrasonic humidifier running in the winter. I also have a handheld hygrometer to monitor the humidity in my growing areas. In the bathroom we have a single, southern window with frosted glass. A variety of Phalaenopsis, my Cattleya cerna (Sophronitis cerna), Dendrobium kingianum, Maxillaria reichenheimianaand a handful of mounted inter-generic hybrids call this home. 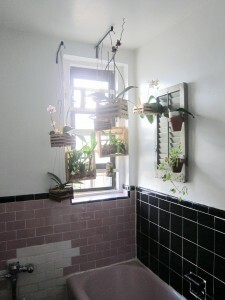 The larger plants dangle freely from extended wall hooks above the window, which usually remains open. For additional hanging space, an old window shutter embellished with handmade orchid hooks has been mounted on the adjacent wall. The mist from the running water seems to keep this bunch quite happy. This growing area is pretty simple. Our bathroom is a little strange though, it is very black and oddly lilac. The shower is also completely separate from the tub. So when the time comes to water, the orchids all hop into the big purple basin where they are gently bathed. Colleen: In regards to time, I normally spend anywhere from 10 – 30 minutes a day watering. My Vanda manuvadee always soaks for 10 minutes every morning. On the weekend, when I fertilize all of my orchids, it normally takes me about 1.5 hours. Colleen: Here in Brooklyn, my heart beats passionately for Vandeacous hybrids. The promise of a spike dripping with red, blue or black flowers is ridiculously exciting. Renanthera Kalsom ‘Red Dragon’, Vanda Manuvadee, and my Vandachostylis Colmarie are presently tugging at my curiosity. But truthfully, all of my beauties captivate me. Ryan: Can you talk about mounting orchids on bark and in baskets (that you made)? Colleen: 75% of my orchids are mounted on cork bark, tree fern or are potted freely within Vanda baskets. While embracing a dedicated watering schedule and providing a consistent breeze, my orchids happily hang around. Mounting orchids on organic material seems natural to me. (Hello, epiphytes!) In my experience, mounting has taken the guesswork out of watering. It also allows an orchid’s roots to be easily observed and saves a significant amount of space in my growing area. If a little extra humidity is required, some long strands of quality sphagnum can be tucked around the mount. For my Cattleyas and Brassavolas that need to be potted due to their larger specimen sizes, I prefer to mix things up a little. I absolutely love to use hydroton, red volcano rock, larger chunks of cork, charcoal and maybe a little bark. Media such as these help ensure that my orchids are dry each time I water. With the fluctuating temperatures and humidity in Brooklyn, I prefer to air on the side of consistency. Adding some inorganic material to your mix will help keep it fresh and well-drained. 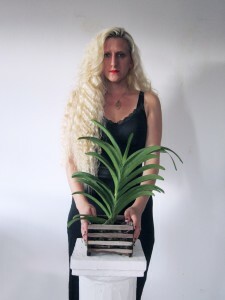 To curb the curiosity associated with the handmade Vanda baskets that you mentioned, please feel free to view my post on them here: Criss Cross Katrina. My Mum, Katrina, is the genius behind this little project! While my Mum’s beau was refinishing their barn, there was an over-abundance of fresh, raw wood. She cut the scraps into perfect little bunches that varied in length. Together we fashioned taller, smaller baskets to house lanky Dendrobium canes and we pieced together upright baskets to mount wispy inter-generic orchids. My Mum even constructed a huge basket that had four smaller baskets notched directly onto each side. It made me smile; it reminded me of a quirky UFO. 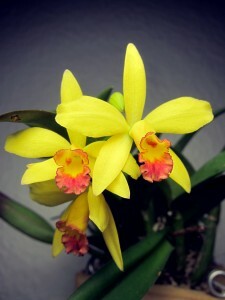 Colleen: I feel as if it is important to be comfortable and confident with your orchid purchases. Know your suppliers! Personally, I prefer to buy from well-known greenhouses, nurseries and successful hobbyists within the United States. In my experience, these orchids are usually very healthy and well-established. Also, these vendors can usually offer helpful advice to troubleshoot any problems that may arise. A little research goes a long way. Do not hesitate to ask other enthusiasts which vendors they may recommend. Colleen: Thank you for your kindness, it was a pleasure to be featured on your blog! Colleen is an artist, interior designer, cat whisperer and orchid wooer. 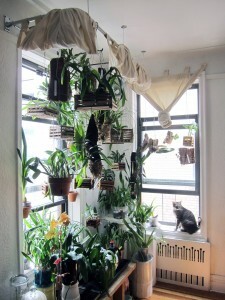 Her large collection of orchids wildly flourishes within her home in Brooklyn, NY. You can visit Colleen’s blog at: http://colleenrochette.wordpress.com/.